As I write this I’m flying home from Las Vegas after the tragic and senseless shooting that resulted in 59 deaths and over 500 injuries. Elena and I were at ground zero when all of this happened. We had been staying at Mandalay Bay Hotel for the last four days, literally a few floors from where the shooter was preparing the largest mass killing in US history. We had been staying just a few floors below him and would host a party in the Foundation Room just a few floors above him the night of the shooting. On Sunday, October 2nd, the night of the shooting, I was holding an investors meet and greet for Cardone Capital. Almost a hundred very qualified investors showed up at the Foundation Room on the 43rd floor of Mandalay Bay Resort to learn more about what I am doing in the real estate space. The event started at 7 pm and at 9:58pm, I announced I was going down to the casino to play some Texas Hold-Em poker, before flying home to Miami. 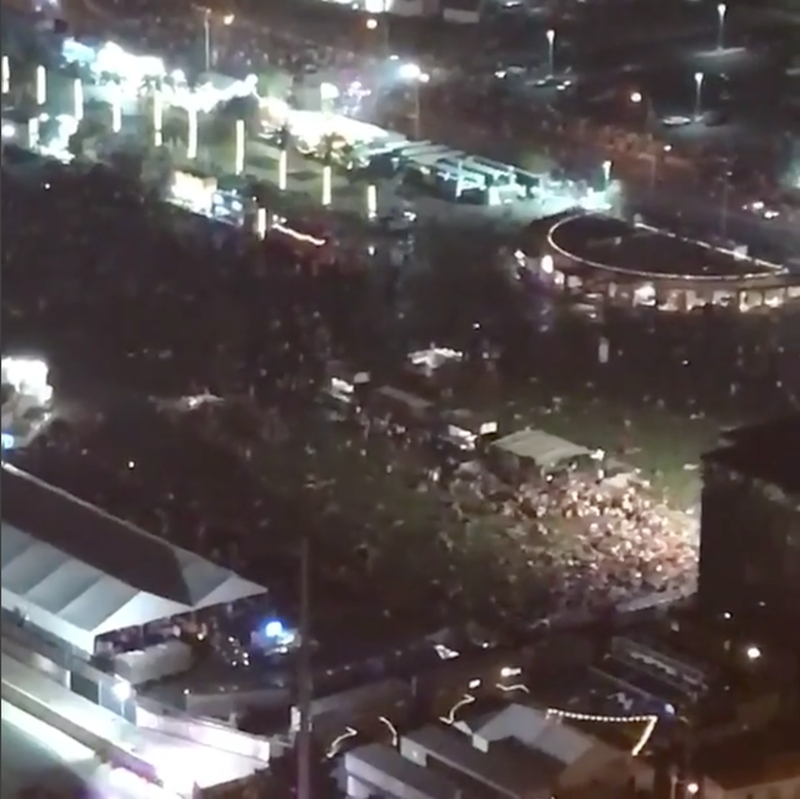 A dozen of us made our way to the casino passing right past the shooter’s floor on 32, while he was setting up to shoot down on the three thousand at the music festival just 1400 yards across the street. It took us 12 minutes to get down to the poker room and by the time Kevin Harrington wins the first hand with Ace high against my camera guy, “Johnny the Camera Guy,” it was 10:08pm the time the shooting was first reported. I opened my Twitter feed to see if anything was happening, only to find out there was an active shooter supposedly at the Route 91 Country concert/festival across the street from Mandalay Bay. For the past three days I had passed the festival gathering on my way to meetings and each time I thought it was a dangerous place to gather. As this is happening, the other half of my team — Captain Ryan Tseko, my other pilot Andrew, Larry Benet, Forbes Riley, Cole Hatter, Legacy (the dancer) and a bunch of clients and investors were still up in the Foundation Room on the 43rd floor. At this time I could feel and see terror start to spread throughout the building. I reminded mt team, “Stay calm, stay close, and don’t run.” The next thing I know the employee executive door just behind us opened and before it could close, Elena calmly and elegantly jumped up and jammed four fingers inside the door just before it closed. I followed Elena to the secure space and my team followed and we all moved into this private space. These back rooms were quickly filling up with Mandalay employees and executives. The first thing Elena did was look for even more secure places to hunker down the team in case of an attack. She looked for offices that were locked and insisted the employees unlock them and then told our team to be prepared to use those spaces if necessary. While she did that, I found a great place to set up to offer a counter-attack in case the shooters were to start moving through the casino shooting people as we were being told. We were later evacuated to an underground holding area as the FBI, Swat and metro Police searched the hotel after the shooting had stopped. I frequently called up to Ryan Tseko, my pilot and real estate partner at Cardone Capital, who was hunkered down on the 43rd floor, with entrepreneur Cole Hatter of Thrive and our new best friend, infomercial queen Forbes Riley, who was still in the Foundation Room with all of our investor friends and SWAT, who we would later find out was on a kill search for the other shooters and accomplices. I knew Ryan was prepared (if you know what I mean) and he too was keeping everyone calm because he was prepared. It was now approaching 11pm and we were being moved into the underground cafeteria with some 200 plus waiting employees and guests. We still didn’t know much more than what was coming over social media and TV. I am guessing that police, FBI, and SWAT had the task to clear and secure one of the largest hotels in the country, Mandalay Bay Resort, to ensure it was safe for guests to return to their rooms. It was then reported that the shooter was dead. Someone asked, “How long do you think we will be here?” I said, “Do the math, 6000 hotel rooms at Mandalay, Delano and the Four Seasons. If it takes 3 minutes to clear, it will take 300 man hours just to clear rooms, there are 2600 cops in Vegas — we will be here until 8:30 or so.” I immediately moved our group to the back of the cafeteria where there were sofas, created some space to sleep and suggested everyone get rest. At 8:30 am we were allowed to leave the cafeteria and go back to our rooms where we met up with the rest of our team. We immediately packed up our bags and had my friend Brad Lea come pick us up and get us to our plane. I am writing this from 39,000 feet as we rush home at 611 miles per hour and can’t wait to hug and kiss our two children. We are so grateful for all of you that I am sure have been praying and sending us good wishes. I believe that you helped us escape this unharmed, so thank you all so much. Be grateful for every moment you have, there are 59 who can no longer do so. There is evil on this planet and you should keep an eye open for it. There has to be a leader who has thought through situations like this and is prepared to lead and make decisions and is prepared to protect the group. A leader is only as good as the team’s belief in that person. People that drink or use drugs are liabilities in situations like these. The only people we had trouble with were these people, they created the most doubt, the most noise, and most uncertainty. Never run out into the chaos. Had we run we would have been out on the streets last night rather than together. Don’t believe everything you see on social media. Most of the information being reported was incorrect. Stay calm and you will make others calm. I am so proud of our team and also the employees of The Mandalay Bay. They were amazing, helpful and were unbelievable strong under all this stress. Send your wife to defense classes so she has confidence in her ability to take care of herself. Elena is amazing and the fact that she has been to multiple tactical training courses made her even more amazing during this situation. And lastly to all of the Gun Control people that will push their agenda in the weeks and months to come. Your proposals will not keep evil people from doing what this guy did it will only prevent me from arming myself to protect myself and my family. The weapon he used is already illegal, yet he still used it. Murder is illegal, he did it. I know from personal experience being prepared in “every way necessary” when things like this happen provides you with a confidence that will transfer to those around you. Everyone should be able to protect themselves and the people around them. Those who are scared of guns are those who refuse to use them then try to get rid of them because they are scared by them. Also, Mandalay Bay and Resort deserves a huge commendation to all its employees for performing in a stellar professional manner.